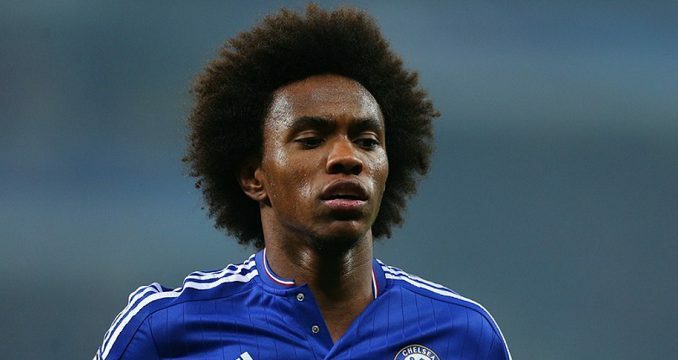 Manchester United have reportedly lodged a late attempt to sign midfielder Willian from Chelsea. According to The Sun, manager Jose Mourinho has turned his focus to the Brazil international after failing to sign a player who can operate on the right wing. The Red Devils have previously failed with a tentative enquiry for Willian earlier this summer, and it appears that Mourinho has revived his interest in the attacker on deadline day. United have placed an ‘audacious last-gasp bid’ for the experienced winger, and it is suggested that he would cost something in the region of £35m. Willian was often used from the substitutes’ bench under Antonio Conte last term, but he still managed to contribute 12 goals and five assists for the west London club. He has started the new campaign as a regular starter owing to an injury to Eden Hazard, and it seems unlikely that the Blues would permit his sale unless they have a couple of replacements in the bag. Leicester City’s Riyad Mahrez has been identified as a potential option to bolster the Blues’ squad tonight, and it will be interesting to see whether Conte would considering selling another player to United. Manchester United have already done positive business with Chelsea earlier this summer with Nemanja Matic proving a huge hit alongside Paul Pogba at the heart of the midfield.